Readers of The Lincoln County News know Chadbourne for his award-winning editorial cartoons, while Stephen King fans everywhere know him for his collaborations with the King of Horror. 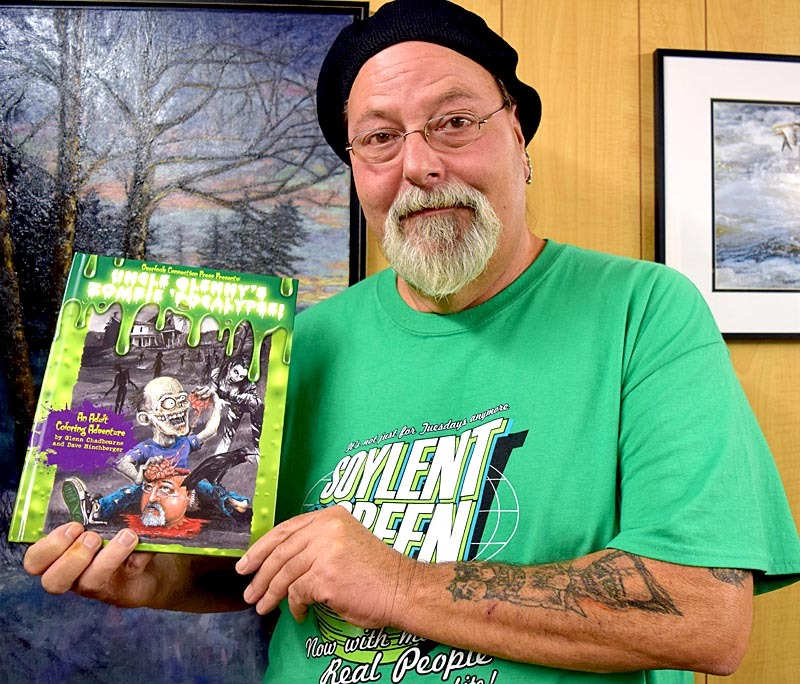 Chadbourne has many other projects to his credit, including the 2014 book “The Rockabye Worm,” but “Uncle Glenny’s Zombie ‘Pocalypse” represents new territory for the Twin Villages native and 1978 graduate of Lincoln Academy. Chadbourne and his publisher at Overlook Connection Press in Atlanta, Dave Hinchberger, came up with the idea. 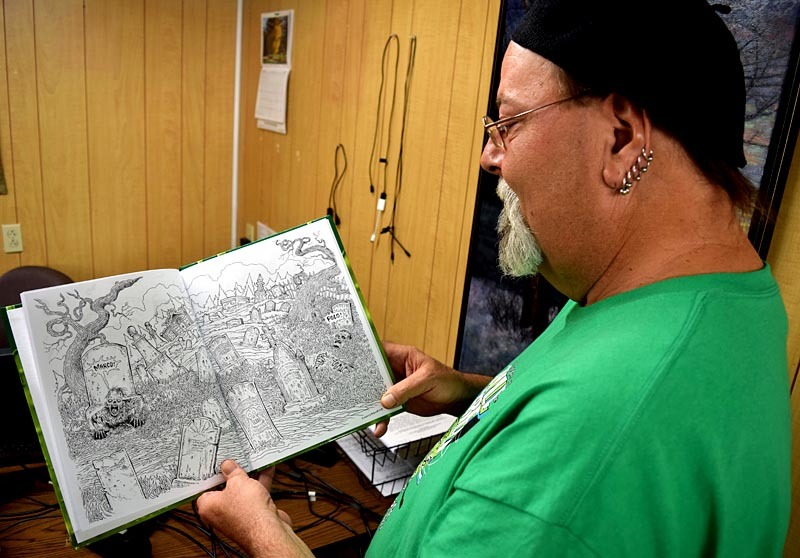 “These adult coloring books are all the rage now,” Chadbourne said. “We thought it would be fun to do a zombie adult coloring book.” His goal while he worked was to fill the book with humor and “good, ghoulish family fun,” he said. The book credits Chadbourne and Hinchberger with the concept, but the art is all Chadbourne’s. Buyers can color the “Diner of the Dead,” a zombie clown juggling brains, a human farmer grinding zombies for fertilizer, and even a zombie exotic dancer. Chadbourne’s introduction to “Uncle Glenny’s Zombie ‘Pocalypse” recounts his lifelong fondness for everything zombie. Chadbourne goes on to describe some of his favorite zombie films and comics from his childhood and recalls watching “the most famous humdinger classic of all,” “Night of the Living Dead,” in the LA cafeteria on Halloween. The book comes in three editions. The paperback sells for $14.95. A hardcover edition signed by Chadbourne and Hinchberger goes for $50 and comes with additional art and a set of zombie crayons in a box designed by Chadbourne. The most diehard collectors can purchase a $200 lettered edition, which comes with the same add-ons as the hardcover, plus one of 32 pieces of the original artwork. Chadbourne has several other projects either in the works or recently published. “It’s about a family of zombies who leaves their son in charge of guarding the herd of humans they have in a pen on their farm,” Chadbourne said. As in the original story, the zombie boy raises a false alarm one too many times – in this case, about a band of humans coming out of the woods to free the herd. Nearby zombies come to help – until, when the zombie boy really needs their help, they don’t believe him. He recently sent out the final artwork and estimates the book will be available in about a year through Cemetery Dance Publications, which is also the publisher of the King special editions. “Uncle Glenny’s Zombie ‘Pocalypse” is available at amazon.com and overlookconnection.com.